This report is a case of macrodactyly of the second and fourth toes of a young girl using bilateral cruciate incisions the procedure details described and similar procedures discussed highlighting the differences and advantages of our procedure. The final outcome is shown and we reviewed the literature as well. 1 – Department of Plastic Surgery, King Fahad Hospital; Tabuk, Kingdom Saudi Arabia. Macrodactyly or gigantism of the toes is a rare congenital anomaly [1-3]. There are two types of the condition: first is the true macrodactyly which is always congenital, and there is the pseudo macrodactyly which occurs in partial gigantism, von Recklinghausen’s disease, Ollier’s disease, Maffucci’s syndrome, Klippel-Trenaunay-Weber syndrome and congenital lymphedema . Temtamy further divided true macrodactyly into two types (a) macrodactyly simplex congenita in which the digit is bigger at birth and grows in proportion (the static type) and (b) progressive lipomatous macrodystrophy in which the digit is bigger at birth, but the subsequent growth is greater and out of proportion . Diagnosis is obvious and can be reached even in utero . Treatment is surgical and aims at size reduction and shortening of the toe with preservation of the cosmetic appearance and comfortable shoe fitting [5,6,8]. A 22 year-old female presented to our clinic with macrodactyly of the 2nd and 4th toes of her right foot (Figure 1). She has had her right 3rd toe amputated previously in another hospital. Following all the appropriate and routine preoperative measures she was taken to the operating room and under general anesthesia and a thigh tourniquet the plan for debulking and shortening of the affected toes were carried out as shown in Figure 2. First the two circumferential incisions were planned to carefully preserve the digital neurovascular bundles. Then the skin between these incisions was excised leaving behind the vessels intact. Next, two v-shaped incisions were made on the plantar and dorsal aspects of the toe to join the circumferential wound rim proximally. This was repeated with two inverted v-shaped incisions joining the rim from the distal axis (Figure 2). Figure 1 The right foot showing megadactyly of the second and fourth toes. 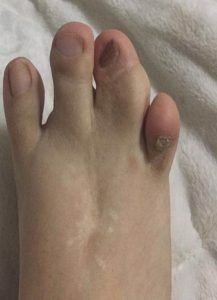 The scar of the site of amputated middle toe is clear. Then all the skin and deep tissue within the v–shaped incisions were excised to debulk the enlarged toe and through the same wound, a segment of the affected middle phalanx excised. Finally, the wound was closed in a cruciate fashion with a K-wire insertion to maintain the digit in a rectus position. At a two-year postoperative follow-up, the result was satisfactory with the toes shortened, debulked and the nails preserved [Figure 3]. With no recurrence the patient is happy having no problems wearing her shoes comfortably and painting her nails. Figure 2 Depicting the cruciate incision on the dorsum of the enlarged toe. Macrodactyly is a rare congenital anomaly with no known etiology [1,2]. Affected individuals experience difficulties in fitting shoes and are embarrassed by the unsightly cosmetic appearance of the enlarged digit [4, 5]. Surgery offers the best solution to this problem and many procedures have been described, all aiming at size reduction and shortening of the affected digit with preservation of the nail in most of the recent procedure [4-10]. The technique we described here meets the three objectives mentioned above with good final functional and cosmetic results (Figure 3). Figure 3 Final results three months postoperatively showing the foot from dorsal view (a) , and planter view (b). With good results with the nail preserved. Fatemi et al described similar technique for the hand , but in two children where they included the distal joint to arrest bone growth. We did not perform an arthrodesis as our patient is an adult and no further bone growth is expected. The main difference between our method and that of Fatemi et al is that we added two v-shaped incisions proximal to the circumferential wound and further two inverted v-shaped incisions distally (Figure 2). This facilitates debulking of the enlarged toe and at the same time allowed us for easy resection of the bone. Fatemi used only the circumferential incision which we think is suitable in their cases as there was less tissue to debulk . Other methods for nail preservation were described but not without complications. The Tsuge procedure preserves the nail but some patients reported a skin bump on the dorsal aspect of the digit . Free nail graft was also tried but the graft survival was compromised by the poor fatty bed, devascularized nail graft, and long term discomfort at the nail [6-8]. Transfer as described by Dautel and others produce good cosmetic results but due to the rigid nail plate, the interphalangeal joint was stiff . We think our method adds a new option for the surgeon in dealing with this problem, its main advantages over other described nail preserving procedures is that the v- and inverted v-shaped incisions facilitates debulking of the affected digit and at the same time allow bone resection. Khanna N, Gupta S, Khanna S, Tripathi F. Macrodactyly. Hand. 1975;7(3):215-22. Minguella J, Cusi V. Macrodactyly of the hands and feet. Int Orthop. 1992;16(3):245-9. Yüksel A, Yagmur H, Kural BS. Prenatal diagnosis of isolated macrodactyly. Ultrasound Obstet Gynecol. 2009;33(3):360-2. Hop MJ, Van der biezen JJ. Ray reduction of the foot in the treatment of macrodactyly and review of the literature. J Foot Ankle Surg. 2011;50(4):434-8. Ahn JH, Choy WS, Kim HY, Lee SK, Lee SH. 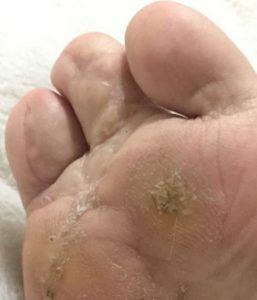 Treatment of macrodactyly in the adult foot: a case report. Foot Ankle Int. 2008;29(12):1253-7. Morrell NT, Fitzpatrick J, Szalay EA. The use of the Tsuge procedure for pedal macrodactyly: relevance in pediatric orthopedics. J Pediatr Orthop B. 2014;23(3):260-5. Sabapathy SR, Roberts JO, Regan PJ, Ramaswamy CN. Pedal macrodactyly treated by digital shortening and free nail graft; a report of two cases. Br J Plast Surg. 1990;43(1):116-9. Uemura T, Kazuki K, Okada M, Egi T, Takaoka K. A case of toe macrodactyly treated by application of a vascularised nail graft. Br J Plast Surg. 2005;58(7):1020-4. Dautel G, Vialaneix J, Faivre S. Island nail transfer in the treatment of macrodactyly of the great toe: a case report. J Foot Ankle Surg. 2004;43(2):113-8. Fatemi MJ, Forootan SK, Pooli AH. Segmental excision of the distal phalanx with sparing of neurovascular bundle in macrodactyly: a report of two cases. J Plast Reconstr Aesthet Surg. 2010;63(3):565-7.